If a story about tea appears on the evening news or in the newspaper, chances are it'll be a story about green tea. Its health benefits are being researched and touted more widely and consistently than other types of tea, probably because of its high antioxidant and polyphenol levels. Health benefits aside, the world of green tea is vast and glorious. There are said to be over 3,000 kinds of it just within China's borders. These teas encompass a wide range of shapes, tastes, and aromas certain to surprise and delight you. Best of all, a much wider assortment of these wonderful, unique teas is available to us than as recently as a decade ago. Hot or iced, green tea is a treat for your tastebuds. Let this be your invitation to try some! Compared with other teas, green teas undergo minimal processing, so they retain more characteristics of the fresh leaf than more heavily processed teas such as black, oolong, or pu'er. This translates to a brewed cup yellow to light green in color with an abundance of herbaceous and vegetal tastes and aromas. Their tastes span a broad spectrum and can be described as floral, nutty, chocolate, kelp-like, and often grilled or roasted vegetables. Green tea has been made in China for at least 5,000 years, although initially it was used medicinally rather than consumed for pleasure. It also looked quite different from the loose leaf form we now use; it would have been quite coarse and mixed with other ingredients. A great deal of refinement was made to tea during the Song Dynasty (AD 960–1279). During this period, a powdered version of green tea appeared that was used ceremonially and as a stimulant. Brewing methods were also fine-tuned. During the Ming Dynasty (AD 1368–1644) tea drinking for pleasure became common for the first time. Tea-makers began processing tea leaves in loose leaf form, and the brewing methods we use today were developed. This was also the time when many accessories such as the gaiwan and tea kettle came into use. The methods of green tea production were kept secret in China well into the 19th century, but now they are produced in an ever-increasing number of countries. While the best are made in China and Japan, some very nice ones consistently come from Vietnam, Korea, Indonesia, and parts of northern India. Other surprising places like Sri Lanka, Taiwan, Nepal, Australia, Kenya, Bangladesh, Rwanda, and even the U.S. also produce green tea. The plantations and places where plants destined to become green tea grow are as varied as the countless manifestations of green tea itself. Plants are grown on large plantations in well-manicured rows as well as in somewhat random, isolated mountain pocket gardens. Its production can take place in highly mechanized facilities, small village factories, or even the backyards of individual tea-makers. What Makes Green Teas Different? Green teas are minimally processed and are not oxidized, and producing them is generally a shorter process than that of other teas. Once harvested, leaves rest briefly to wilt and release their aromas before heat is applied to "fix" them, stopping any further chemical reactions from taking place including oxidation. One of these halted reactions is the browning of the leaves. Not only do the leaves of green tea stay greenish because of fixing, but also many compounds like their polyphenols, amino acids, and vitamins remain intact. Spring teas are particularly high in antioxidants as the plants are coming out of winter dormancy. While it may be an oversimplification, two primary styles of green tea exist: Chinese and Japanese, and they are quite different from one another in character. Chinese greens are generally lighter in color and flavor while Japanese greens exhibit more intensity. How the tea leaves are fixed largely distinguishes the two styles. Japanese-style green teas almost exclusively use steam to fix leaves, and the result is a fairly assertive tea that often has hints of seaweed or kelp in its taste, is lemony, and rarely sweet. Chinese-style green teas instead use baskets, pans, woks, or ovens to fix the leaves. These methods result in more delicate teas with a sweeter taste, oftentimes with hints of toastiness or even cooked or grilled vegetables. Production of green tea in China is so widespread that processing techniques vary among regions and even villages. Perhaps for this reason Chinese greens also display a wider range of shapes than teas from other cultures. If you examine the tea leaves after they've steeped, you'll often find that Chinese greens still have the bud and two leaves intact exactly as they were when plucked. Conversely, Japanese greens are usually composed of pieces of leaves. Consequently, they have a much shorter brewing time. Loose green tea comes in a very wide range of shapes and sizes with very different aromas. Trusting your nose to select one you like is a good rule to follow as you learn this group of teas. Expect leaves to range from yellow to green to brown. More often than not, they will abound with herbaceous fragrances. Sometimes they'll have citrus notes, sometimes toasted, roasted, or floral scents. They should smell fresh—definitely not like dried hay. Japanese-style green teas will be comprised of broken and fragmented leaves, but don't take this as a sign of lower quality. While Chinese-style greens more often than not consist of two leaves and a bud, this usually isn't obvious until brewing. Check out the Chinese and Japanese green tea pages for more details about each. Also check out how to shop for loose leaf tea. Use cooler water for brewing green teas than you would for brewing other teas darker in color. 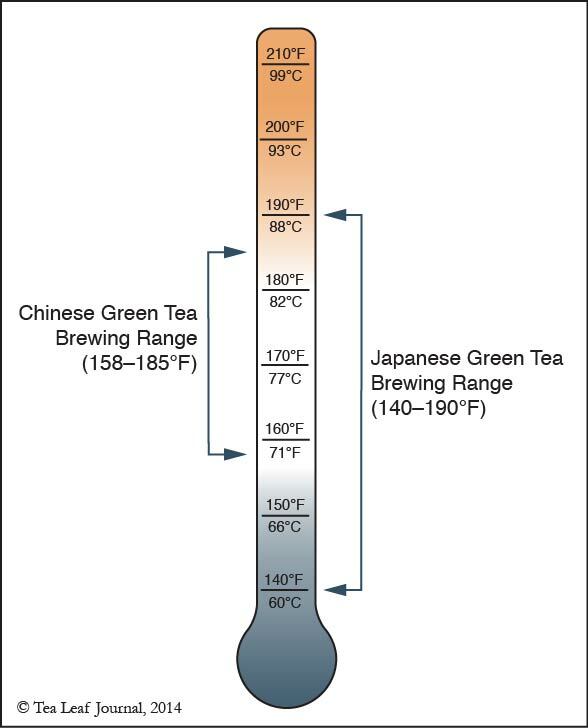 Japanese green teas require a range from 140°F (60°C)–190°F (88°C) depending upon the variety; Chinese greens are best brewed in a narrower range between 158°F (70°C) and 185° (85°C). Pay attention to any accompanying packaging to learn the best temperature for your tea. Generally speaking, infuse leaves for as short as 30 seconds for an initial infusion and up to 2–3 minutes for subsequent brewings. You can usually infuse green tea leaves two or three times. Try to drink green teas within 6–8 months of purchase. Japanese green teas are sometimes sold in vacuum-sealed packages intended for refrigeration. For these, keep a small amount at room temperature for daily use to avoid too many trips in and out of the refrigerator. Otherwise, store them as you would other teas, keeping them at room temperature in airtight containers so as not to absorb odors and moisture from the environment. Avoid exposure to both sunlight and excessive heat as both can degrade the tea leaves and destroy the aroma.